Canon EOS 1200D sensor review: Rebel with a cause? While Canon has regularly updated the upper entry-level EOS XXXD (Rebel TXi) model, the maker has only periodically upgraded its entry-level model. 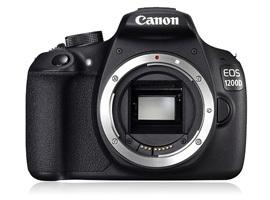 As a result the 18-Mpix EOS 1200D (Rebel T5) is an upgrade of the 12-Mpix EOS 1100D (Rebel T3) introduced back in 2011. As well as adopting the higher-resolution sensor found in the maker’s past and present EOS XXXD (Rebel TXi) models, the EOS 1200D (Rebel T5) also features the older-generation Digic 4 level image processor rather than the latest more capable Digic 5. 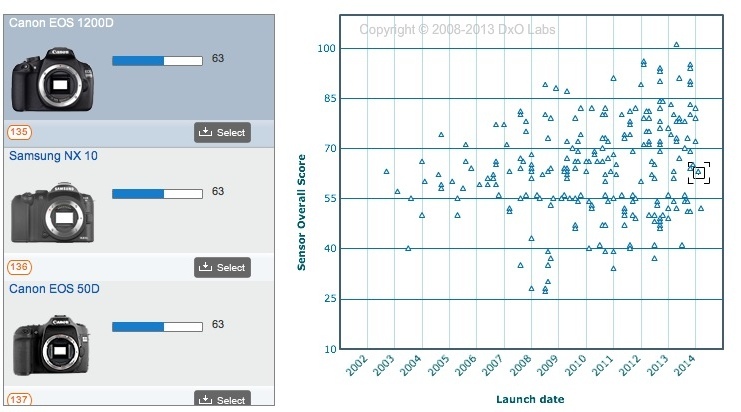 Still, this means the camera adds the ‘cinematic’ 24fps frame rate to the Full HD 1080p video recording of 30/25 fps of the earlier model and gains a new expanded maximum ISO sensitivity option equivalent of ISO12,800. The old maximum ISO 6,400 remains the same, however, which is the highest setting used for the Auto ISO option and movie modes. While the headline news is the adoption of the 18-Mpix sensor, other improvements are really only slight over its predecessor. It gains a larger 460k-dot 3.0” rear LCD (up from 230k dot, 2.7”) and a range of five new filter effects plus it adopts the firm’s new menu layout but this upgrade is clearly aimed at keeping the price competitive. As a result the Canon EOS 1200D (Rebel T5) is one of the most accessibly priced DSLRs and is available at around $549, including EF-S 18-55mm IS II f3.5-5.6 kit zoom. 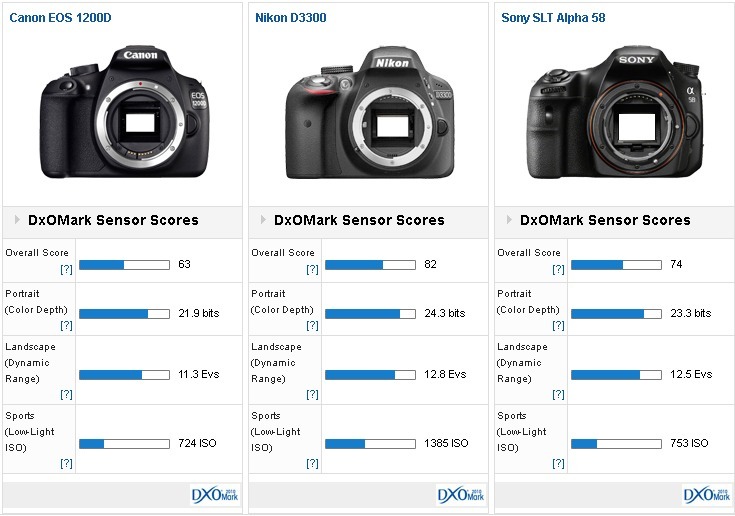 With a DxOMark a score of 63 points, the 18-Mpix CMOS sensor delivers a somewhat predictable if slightly underwhelming performance. It ranks in 135th place overall in our sensor performance database and 111th of those with APS-C size sensors, ahead slightly of models like the Canon EOS 700D (Rebel T5i) with a DxOMark score of 61 points. Color depth at 21.9 bits is somewhat behind the best of the current entry-level models, as is the 11.3 Ev dynamic range, and low light score of 724 ISO. Though to be fair, those models are more expensive than the modestly priced Canon. The Canon EOS 1200D (Rebel T5) ranks in 135th place overall, but it remains a strong contender for the intended market. Compared to this model’s main rivals, the Nikon D3300 in particular but also the Sony SLT Alpha 58, the EOS 1200D (Rebel T5) results aren’t particularly close. Looking at the individual scores, the Nikon sensor has +1.66 stop advantage in color and a 1.5 stop wide dynamic range, yet as ‘entry-level’ Nikon model, Raw files are 12-bit compressed only as opposed to the Canon’s 14-bit output. The Nikon has an extra 1-stop advantage in low light capability as well. Even the older tech Sony sensor can boast higher pixel count, a 1.0 stop improvement in color, and a 1.33 stop wider dynamic range. Where the Canon is targeting users moving up from compacts still, the Nikon D3300 is aimed at the slightly more demanding user, someone who is prepared to pay a little extra for the 24-Mpix CMOS, 11-point AF system ad 5fps burst rate. The same applies to the A58 though with a 20-Mpix sensor and plastic mount, the Sony is targeting the more budget conscious. All three so-called entry-level models appeal to slightly different users with different aspirations. 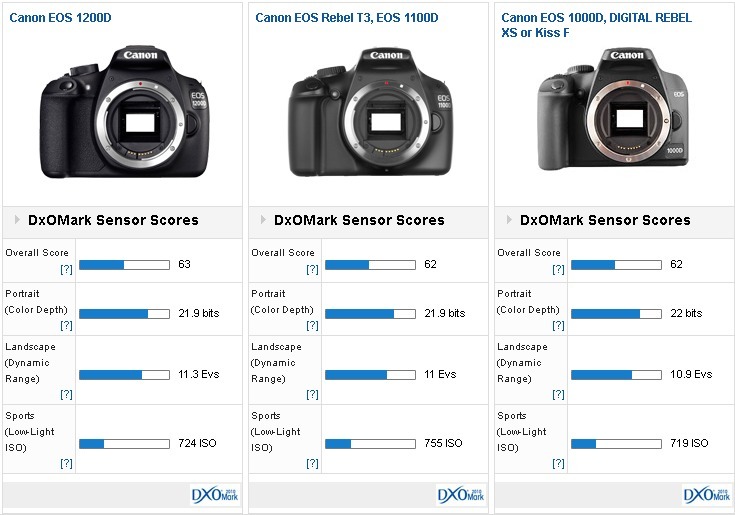 Compared to its predecessors, the upgraded EOS 1200D (Rebel T5) has only a marginal increase in the DxOMark score. Although, at first sight, that may seem disappointing with no improvement in performance over the years, that’s not strictly true as the pixel count has increased by 50-percent over the EOS 1100D. That equates to around a 21% increase in image size, and sounds promising with regard to detail rendition, if the results of previous lens testing with related 18-Mpix sensors from Canon are anything to go by. Although color depth remains unaltered, Canon has managed to improve dynamic range by +0.3 Evs and maintained the low light capability. 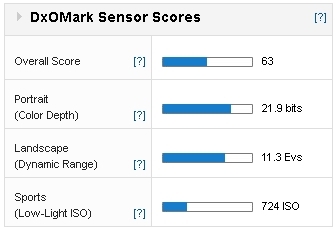 Anyone thinking Canon would push boundaries with their entry-level model will be disappointed with this DxOMark sensor score but it’s worth remembering the sensor and imaging chain performs well, just not at the same level as more expensive rival options. Enthusiasts will want to look at better-equipped models further up Canon’s range but anyone moving up from a compact will find the sensor performance and the practicality of a DSLR like this to be leaps and bounds ahead.